Movie Review: Hereafter- Eastwood’s Contemplation of Death and the Afterlife Lacks Substance but Has a Deep Focus on Character Experience | Generation Film! There are many intellectual and spiritual concepts that are incredibly difficult to explore in a substantial and concise manner through cinema. Kubrick phenomenally captured the eloquence and vastness of human evolution and its link to cognitively influenced technological advancement in his masterpiece 2001: A Space Odyssey while just a couple years ago Darren Aronofsky’s underappreciated film The Fountain elegantly portrayed a fight against the inevitability of death. It is the latter concept that is similarly ventured in Clint Eastwood’s latest film Hereafter, which was written by the diversely talented Peter Morgan (The Damned United/The Queen) and focuses on the idea of a metaphysical afterlife beyond the limits of our human perception. Clint Eastwood hasn’t really been a filmmaker of concept as much as he is a director of character so it comes as a surprise that he would tackle a film that contemplates mortality in such a spiritual way. While his latest film is conceptually superficial it certainly allows its characters to be emotionally resonant with the audience. Herafter balances three different and inevitably integrating stories involving death which ultimately becomes a continuous series of paradoxes that include combined adjective phrases such as languidly beautiful and spiritually shallow. Eastwood’s abilities behind the camera are never questioned and proves again that he can utilize every image to tell a compelling story, but Hereafter really just suffers from the film’s timid approach to a subject that contains a great deal of depth. However, for those looking for a compelling character driven drama Hereafter will please those who have the patience to get through the intriguing beginnings of the story and bear the latter half’s meanderings. Stories that attempt to link different characters in different countries conceptually can become convoluted. However, Peter Morgan is a master at character and plot as evidenced with his various script successes including Frost/Nixon, The Queen, and last year’s The Damned United. With Eastwood at the helm there is no doubt that any story will be told concisely for he is an efficient filmmaker and is able to control complex plot structure, which is also seen in his intense dramas including Mystic River and Letters from Iwo Jima. Hereafter takes three individuals from different countries, all still Western influenced cultures, and their experiences with the subject of death and the afterlife. The first subject is a famous French news correspondent named Marie LeLay (Cecile De France) who experiences death via drowning after an unexpected and violent tidal wave hits her vacation spot in South America. Her experience with a metaphysical plain of existence where others are waiting together becomes a distraction and then an obsession that drives her life towards finding an answer. Another character is a young British boy named Marcus who has an “older” twin brother, Jason, who dies in a tragic car accident. Both were very close and protective of their drug addicted mother and complicit with fooling child services. Marcus, feeling incredibly lonely without his identical counterpart, tries to find someone to help him communicate with Jason so he doesn’t feel so alone. 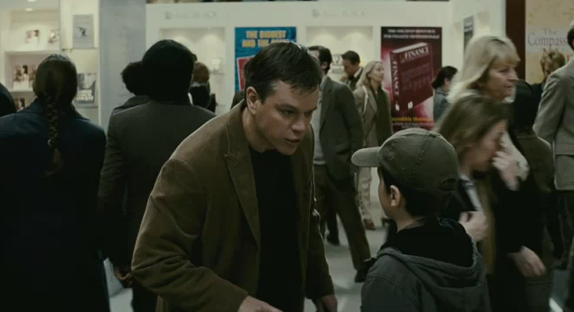 The last and essential character to the story is George Lonegan (Matt Damon) who has, what he believes, a cursed ability to communicate with the dead through the connection of human touch. While his older brother views it as a gift, George’s personal life remains distant and shattered due to his constant proximity to death. All of these tales inevitably intertwine, though they remain much more interesting when they have their own focus. Instead of having a linked plot Eastwood could have taken the conceptual route of having select and totally separate tales of death and what each of those perspectives could mean to our mortality. Because the script requires a focus on the developed character’s experiences of death and the afterlife it is practically essential for the acting to reflect those complex characters to carry the film’s desired concept. While Matt Damon can be a tad flat in other roles that require some more liveliness he is rather well fit for the role of George Lonegan. This is mainly due to George’s loneliness and alienation from society as a whole providing a perfect use of Damon’s emotionless delivery but handles the other scenarios of frustration and pain rather well. Usually with Eastwood films the children who are cast are rather hit or miss, which was the case for the inconsistent performance of Bee Vang in Gran Torino. However, the twins Frankie and George McLaren who play the young boys handle their scenes rather well despite some lagging moments that aren’t necessarily to blame for their performance but rather the scripts less revealing elements. Cecile de France who plays Marie, the French news correspondent, is really the key character due to her inevitable obsession to revealing her brief experience in the afterlife, which she is determined to prove exists. Her personal battle with the lack of evidence versus personal experience can remind all of us of our struggle with our own limits of reason. This determination doesn’t end in ridicule or tragedy but instead allows her to share it with the world in the form of a book (which looks surprisingly similar to Dinesh D’Souza’s Life After Death…coincidence?). All of the actors handle their scenes well, including some momentary side characters played by Jay Mohr, Bryce Dallas Howard, and Richard Kind, which inevitably drive the focus of character that are always at the center of an Eastwood film. As talented as a director Clint Eastwood can be he is certainly nowhere near the conceptual filmmaker say Stanley Kubrick, Akira Kurosawa, or even Darren Aronofsky who is a marvel of a modern film artist. Eastwood is a storyteller and not an artist so his attempt at conceptualizing the afterlife and death in his latest film endeavor, Hereafter, inescapably becomes shallow. The imagery is beautiful (despite the lackluster special effects), yet the concept being explored becomes less and less profound as we get closer to the characters the film focuses on. Due to its languid delivery Hereafter isn’t an enjoyable drama nor does it allow us to really contemplate something new or unique about the afterlife. There are intriguing parts about the film especially when regards to the individual experiences of the characters. But as their stories begin to integrate the less interesting the idea behind the script becomes. Luckily the well developed characters and the actors portraying them connect with us and our varying questions about the possibilities of a metaphysical world beyond human perception. Still, Hereafter is just another efficiently made Eastwood film that fails to fully engage us into the hearty and profound subject of death that has limitless possibilties.